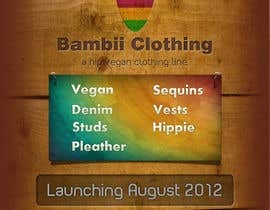 a hip vegan clothing line, also gay friendly that is launching in august 2012. trendy, funky, studs, pleather, sequins, bright colours... hippie/80's style. How is this contest still open after it has been awarded? Can we still submit designs? 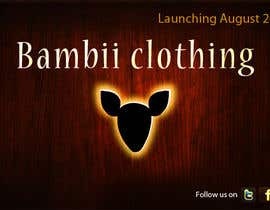 ** I like simple marc bambii head best, the wider look, I like this however I would rather have wooden header and footer across top and bottom and white background with different pattern inside deer head. 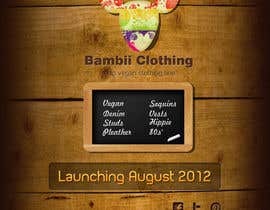 -Wooden Header and footer. and in white BG at middle is this right? designed at the focal point to get attracted. i think if you decrease the content it would look better. 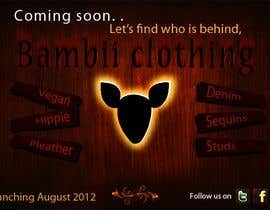 just look to any professional ads u can find the main principles, feedback please, !! tuanrobo, I like background, can you change bamboo head and pattern inside and text for bamboo clothing, I am going for more of an edgy trendy look rather than girly with flowers. Instead of having the words around like that can we have them in a straight down list. 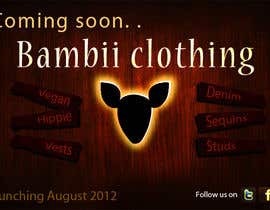 dipcore, I do not like the deer body, maybe take that out and put list in centre? You could use skull pattern inside box for colours :) Great start ! Good Day Any comment or suggestions to #5 in addition i read that it needs to be something exciting the file is actually a gif file moving words that tells "Are you ready?" 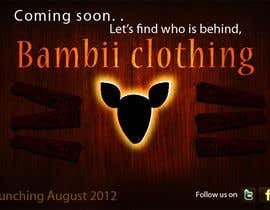 "for" "BambiiClothing" "Launching August 2012". here are some burnt wood social media buttons I would like to use. I would also like a burnt wooden beam going across top and bottom of page as footer and header then in the middle a big fawn head silhouette, either black or pattern in the skulls I have provided. 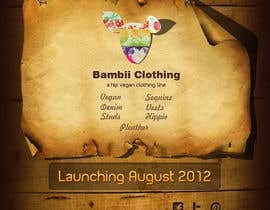 The words listed underneath with some accent colours somewhere Vegan. Pleather. Studs. Denim. Sequins. Vests. Hippie. Launching August 2012.
its only one simple page with a fawn head, some social media and some words. I can send more if you show me your work. Do u think all is made with this least price? ?